By CARP Italy, Giuseppe Cali: On November 7-8 2015 around 20 Italian CARP representatives gathered in San Marino to discuss about future programs and to decide the National representatives for the next year. With the participation of Giuseppe Calì, the national leader, CARP members from Rome, Milano, Padova, Bergamo, Napoli, started the program dedicating the first morning to serve some humanitarian organizations. Coordinated by Giorgio Gasperoni, national leader of San Marino, they participated in a program to serve three different organizations, taking care of homeless, young handicapped, elders. From gardening, to preparing food and distributing food door to door, from cleaning to playing together with young handicapped, they experienced the sacrifice and parental heart of all volunteers that dedicated their lives to serve people in need. It was overwhelmingly inspiring for all of them. 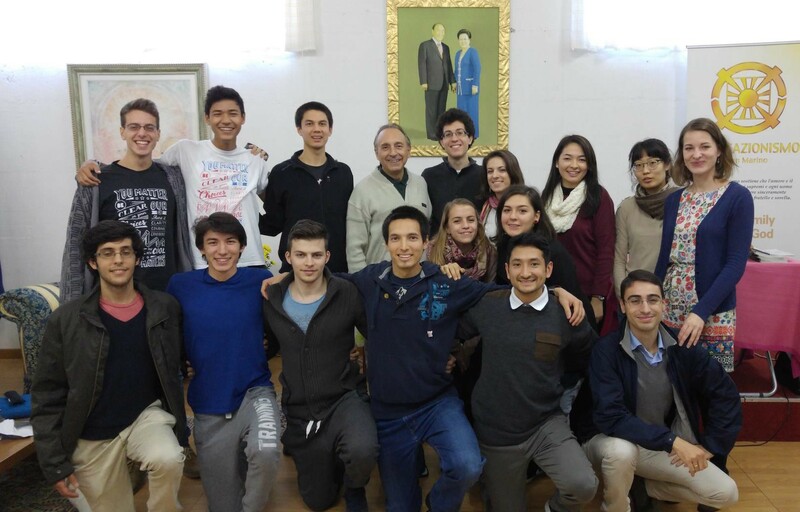 A report, by Fiorella Capone on the TOP GUN workshop in Korea, included some lectures about personal development, gave everybody a clearer understanding of the care and expectation that True Parents have for our youth. This lecture was followed by a group discussion, in which they offered their ideas for the future. The day finished with a session of reports from the various cities. It was impressive to see how much our youth is active and involved in many activities especially in Rome and Padova. CARP members from other cities were challenged to follow their example and determined to do more from now on. Next morning, after hundocche and breakfast, Giuseppe Cali gave a two hours lectures with the title, “Let’s learn from history to understand our direction”, explaining the parallel between the early Christian history and our time, especially centered on the clarification about the essence of Christ. Who are True Parents for us and for all mankind? Why are we divided based on different understandings on the essence of True Parents? In the lecture a clear Principle and historical explanation was given, followed by an explanation on the concept of “ownership of Cheon Il Guk” and the importance of taking initiative. Finally, the participant elected their representatives for 2016, including the votes from other 2nd gen through internet and the final approval from the national leader. Antonio Vallone was elected for the 2nd year, besides Fiorella Capone and Elena Chirulli. The meeting concluded with a prayer and a “On Mansei”. As national leader I’m very proud of the Italian 2nd gen and young Unificationists. Among them there are several potential leaders. I announced that I’ll ask them to take responsibility as pastors and other main responsibilities very soon. To be prepared well they should dedicate more to the Providence and raise their younger brothers and sisters. Their response was encouraging and inspiring. While we experience the same difficulties like in other nations, Heavenly Parent and True Parents can rely on us for a better future and the building of the CIG in Italy.